Aaron Rice is nicknamed “Encyclopedia” among his friends. 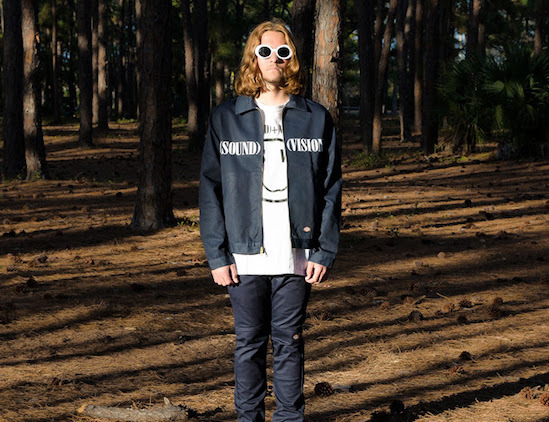 Only 21 years-old, the creator and designer of streetwear brand (Sound) + (Vision) can rattle off music and fashion facts from decades before his birth, and regions outside of his Delray Beach, Florida home. Rice often spends his time tediously tracing origins of Japanese staple brands like Number (N)ine; combing (and translating) the web for rare finds in foreign countries; and reading—yes, those things called books. Calling him an old soul would be an understatement. 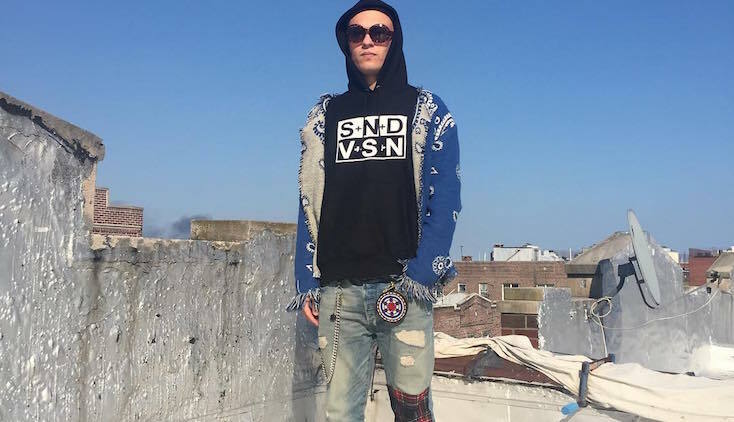 Unaffected by this generation’s obsession with the now, Rice takes the time to learn music and fashion’s icons, even if it separates him from his peers. “I spend a lot of time by myself,” he says. “When I’m in the crib I listen to music, so when I started the brand, I wanted to do something that has to do with what I like: clothes and music. I just mixed the two, and I always liked how rock stars dressed so I was like, I’m just going to do rock and roll music.” His attention to detail and reverence for icons have earned him attention not only in Miami, but also from fashion’s new thread of cool kids. Using his learnings of glory days past, Aaron Rice’s curiosity propels his aesthetic forward. Rice is a real sucker for nostalgia. 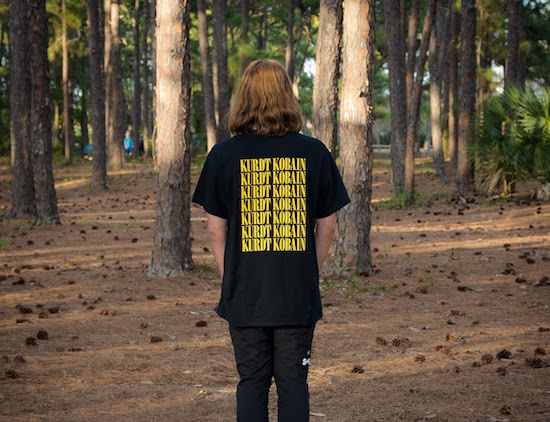 I was making a random t-shirt, and I was just like, “Let me do a Kurt collection.” But I’m not going to do Kurt forever, even though he’s one of my favorites and a lot of my inspiration comes from him. I played with the spelling because I read his journals [and] everything Kurt basically has out there. He would sign his polaroids and his letters, “Kurdt Cobain.” The only person to ever make a shirt spelling “Kurdt” like this was Number (N)ine, but I didn’t even know until after I made mine. No one’s ever used the full name on a t-shirt before so I just did it. I wanted it to be little things, but something unique. Use what you have until you can get what you want. These [jeans I designed] are supposed to kind of be like Junya [Watanabe]’s Levi’s, but I made my own Levi’s because I can’t afford them. I went to this tailor, and I just worked with him. Make do by any means, even if you’re not classically trained or haven’t learned the traditional way. Everything isn’t for everybody. You can be creative without being formally trained. Whatever you’re trying to do, research it. Do thorough research to where you carve out your own lane just from knowing stuff that no one else knows. Even the branding of (Sound)+(Vision) is a tribute to rock history. Rice’s unique style comes from his attention to details. Whenever I like something, I study it to a T. All of those Japanese [designer] dudes used to double-tag, so I’m double-tagging. When they were 20, 21, they were doing what I’m doing. If I’m doing something, there’s a reason. Half of the stuff that I know, you can’t just Google. Everything you need to know is inside of a book. Everything. Rice’s breakthrough moment as a designer came courtesy of Virgil Abloh at Miami’s Art Basel and his twelfth grade art teacher who made the trip possible. The first real shirt that I liked that I made said Balmain, but it was the way you pronounce it, and on the back, it had this huge tiger because there’s a Balmain rugby team, literally spelled the same way the company spells the clothing. The mascot for the rugby team is a tiger so I just took it and made a long-sleeve. Virgil saw it at Art Basel in 2012, saw me, and I took a photo with him and started talking. He was like, “Yo, who makes this shirt?” I was like, “I do.” He was like, “Yo, this is nice.” That’s the first time someone had actually recognized me for my clothes. Hey, hypebeasts, Rice says just be yourself. I feel like everyone goes through that phase where you find yourself. Now, I’ve found myself. I hate when people just wear Supreme this, Supreme that, or just wear like a hype brand. You’re just buying it because someone else has it, bro. Wear stuff because you like it. Be consistent, and if you’re making clothes, make good, original ideas. Get out there and show people. Before you create a name for yourself, everyone always compares you to someone else—until you find yourself and you just create your own lane, and then you’re your own person.